The functional residual capacity (FRC) plays an important role in maintaining optimal ventilation. FRC is a subdivision of the total lung capacity (TLC) and represents the volume of air left in the lungs at the end of an expiration. It is involved in keeping the small airways open for an efficient gas transfer between the air and the blood. Variations in that volume can be seen under several physiological or pathophysiological conditions and can be associated with clinical symptoms like dyspnea. FRC is a clinically important parameter which is determined, along with other lung volumes/capacities, when performing a full lung function assessment. It is inversely related to airway resistance, such that a reduction in FRC will increase the level of opposition to airflow. At the preclinical level, while measurements of airway resistance are routinely performed in many research laboratories, the determination of FRC is rarely reported as it can prove to be technically challenging, especially in subjects as small as mice. 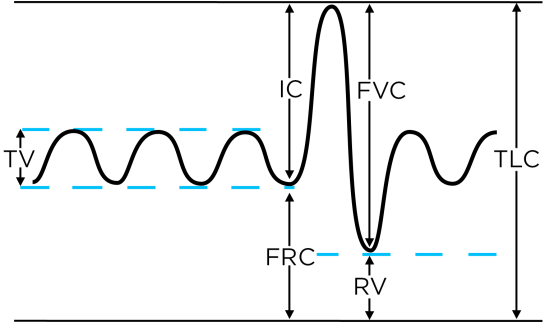 It is possible to obtain FRC from a full-range pressure-volume (PV) curve. This was done until now in mice by determining the volume at a conventionally or arbitrarily defined equilibrium pressure (e.g. 0 cmH20), since FRC represents the volume at rest. In a recent report1, FRC was estimated by a novel approach in rodents, following the automation of the full-range PV curve technique with SCIREQ’s flexiVent system. It was estimated by volume subtraction and took advantage of the access to varied, precisely controlled, automated maneuvers within a single device. In comparison to the previously established methodology, this novel approach demonstrated a more accurate estimation of FRC, particularly in diseased subjects. The estimation of FRC by volume subtraction can be performed in rats and mice along with the determination of other lung volumes/capacities, measurements of respiratory mechanics, or partial PV curves. The authors showed that the FRC estimate more than tripled in a mouse model of emphysema, representing the most important change in a panel of lung volumes/capacities. Including measurements of FRC and other lung volumes/capacities in the characterization of respiratory models or novel therapeutic strategies can contribute to generate comprehensive and robust functional assessments. No model fully recapitulates human respiratory diseases. Let’s reconsider the endpoints typically reported so that nothing that matters gets ignored. 1Robichaud, A et al. 2017. Automated full-range pressure-volume curves in mice and rats. Journal of Applied Physiology 123: 746-756.